I got into New York at 2:30 on Friday afternoon and I met up with B. at our “Swiss Hostel”-1291 House. It was pretty much of a dive, but the price was right- $163 total for the 2 of us. We had a lot of fun spending the money we saved on lodging! The Threads Sewers Guide to New York is a fantastic resource. They keep it up to date so that we even found places that had recently moved. The first place we headed for, was a fabric store just a few blocks from the hotel- Greenberg & Hammer. The original plan was that I would go there while waiting for B. to get into town- but her bus was very early and she got in first… so we went together. The store is much smaller then I expected after looking at their large website- funny how that works- They have a display of dolls and fairies in their window which is also on their website… but much better in person. After G. & H. we took the subway to SoHo, and went to Handloom Batik Imports. She had some very interesting fabrics there- some might have been the same batiks my Mom used to buy from Thai Silks, back in the 70′s and 80′s. Lots of little gifty things from India. There were Ikat dyed fabrics, plaids and other interesting fabrics. Also clothing, though I didn’t really look at that. I bought 1/2 yard each of 2 different Ikat fabrics- hand dyed and woven silk and cotton mix. 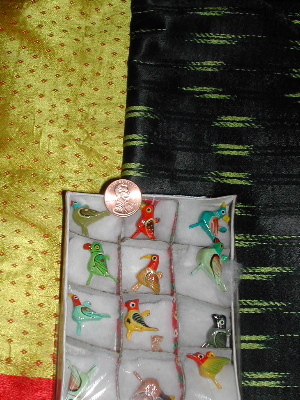 Also some tiny painted birds that could be used as beads. On Saturday morning, we got down to 34th Street at about 9:30 am, and wandered around since lots of the stores weren’t actually open yet. We walked up and down the streets until we got up to 40th and then we dove in. We went to Rosen & Chadick, Paron Fabric Annex and NY Elegant Fabric (bought tiny black polka-dots on fine white cotton fabric) on 40th between 7th and 8th. 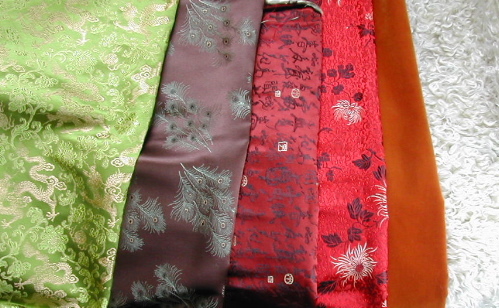 Then we went into B & J Fabrics where I eventually bought 4 1/2 y. pieces of chinese silk brocade. I have to say, this was our favorite fabric store. It is on the second floor and the light is wonderful. Lots of the fabrics are displayed by a piece, on a hanger, and this makes it really easy to look. They also have notebooks with fabric. I looked at one of Liberty cottons. Also, everything is clearly marked for price. By noon, we were glazed over so we went and got a caffeine refill, sat for 20 minutes and decided that we needed to look at something besides fabrics. Buttons- 69 W. 38th St. It is not on the Threads guide. I love this store. It is small, but the man in charge (I guess he is the owner) was there both times. He is chatty and friendly and helpful. He is interested in what you are doing and tells about projects he is working on. He told us he could dye buttons to match any color we wanted. He showed us some Chanel buttons he had dyed a very pale green to match a Chanel fabric swatch. It looked beautiful. He was working on some trays of dyed buttons- cleaning them up. He had the fabric swatches he had matched. 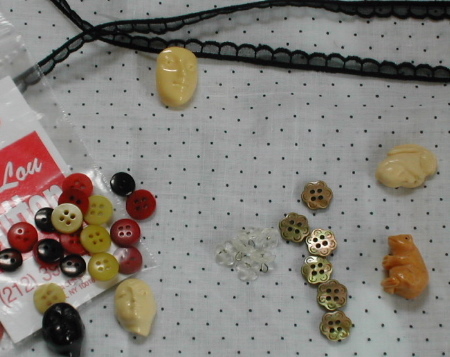 I bought a selection of small buttons- 6 of each color. I always try to buy 6 of the same button- this works well for me. I also bought some beautiful faces. I think they are resin. Next stop- Tojo Shoji for beads. Wow, was it crowded and busy here. Lots of good stuff, although nothing really unusual. Lunch break at 2pm and we discussed the next plan. Both of us wanted to go back to B & J Fabrics. There were things we needed to think about more and look at again. I ended up buying a fake fur called “Yeti” (need to see if I can dye this) and a golden brown cotton velvet. I love the color. We were getting pushed out as they were closing at 4:45. Next stop- back to SoHo and Leekan Design on Mercer St. I had also been here 2 years ago and really liked it. This time, I was not as charmed- maybe I was just too tired, but also it was busy and people were pushy and the beads and charms they had seemed the same as I’d seen last time- nothing new. I bought a little frog and rabbit, same as I did 2 years ago! There was one other place I really wanted to go to, but both evenings when we were in the neighborhood, we got there too late- CFM Gallery. It had been recommended by someone from FOCD- the doll mailing list- as a place I might like. I think it specializes in figurative art. Dinner, rest the feet and then wandered around Soho a bit more. We found a store called Old Japan, which had lots of Japanese folk crafts- always interesting to me. They had pieces of fabric (about 6″ x 10″) put together into collections- for example 10 assorted indigo dyed swatches, or fancy and colorful silk with cranes or dragons, cottons with kites or flowers- good for quilting and lots of other things I’m sure. Time to go back to the bunk beds(!) and collapse. Sunday morning we packed up our purchases and walked down toward Port Authority. B.’s bus was 2 hrs. before mine, so we split up at around 11:30. I kept walking down to The City Quilter . They had some books that I was very interested in seeing, including the new Susanna Oroyan book, Dolls of the Art Deco Era. I’ve got to get this one. Onward downtown, past Barnes and Noble- quick stop to see if they had any magazines I wanted for my trip, and last stop at Beads of Paradise on 17th St. Lots of very interesting beads, textiles, sculptures and household items from Africa, Asia and probably South America. I think I saw almost everything I wanted to see except the CFM Gallery. Going on a trip like this with someone who also wants to look at fabric makes it Much more fun! We had a fantastic time and hopefully will do it again next year!